The Skinny: A Japanese take on a Shakespeare classic that rivalsif not topsall previous and subsequent Western interpretations. 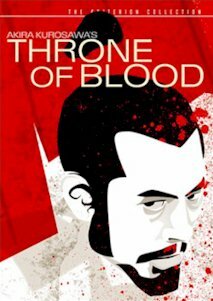 Master filmmaker Akira Kurosawa channels the Bard to create Throne of Blood, a simultaneous adaptation and expansion of the famous tragedy Macbeth. In many ways, it is the very "Japanese-ness" of Kurosawa's retellingthe characters, the setting, the style, and the deviations from the original textthat makes the film a standout among all other previous and subsequent adaptations of the Shakespeare classic. Toshiro Mifune takes on the Macbeth role as Taketori Washizu. Early in the film, he and fellow compatriot Miki (Minoru Chiaki) find themselves lost in the wilderness surrounding their lord's castle. In the maze of trees, they meet a creepy witch who prophecies that Washizu will soon rise to power, but that Miki's offspring will assume control thereafter. The two soldiers return to the castle, and quickly learn that one of the witch's lesser predictions has come to pass. This turn of events so affects Washizu that he tells his wife, Lady Asaji (Isuzu Yamasa), about his supernatural encounter. And like Lady Macbeth, the thoroughly ruthless Asaji convinces her husband to murder the feudal lord and usurp power. Though initially resistant to her commands, Washizu gives into his wife and commits murder, the first step in a long, bloody road to ruin as Washizu succeeds in fulfilling his end of the prophecy, but ultimately traps himself in a claustrophobic hell of his own making. Notes:  Kurosawa and his co-writers did not refer to actual copies of Macbeth while drafting the screenplay, but instead relied mainly on their memories of reading the play as students. In fact, some had never read it in the first place.  In the climactic arrow scene, the fear on Toshiro Mifune's face may not be just good acting. Though safety precautions were taken, archers fired real arrows at Mifune.  Noh masks influenced the makeup and the mannerisms of some of the characters, Lady Asaji in particular.  The Criterion Collection DVD offers two alternative subtitle translations: one by Japanese-film translator Linda Hoagland and the other by Kurosawa expert Donald Richie.